Soldiers from the 4th Rajput Infantry Battalion of the Indian Army handling INSAS rifles during a training mission. The Indian Army (IA, Hindi: भारतीय थलसेना, Bhāratīya Thalasēnā) is the land-based branch and the largest component of the Indian Armed Forces. The President of India is the Commander-in-Chief of the army, and it is commanded by the Chief of Army Staff (COAS), who is a four-star general. Two officers have been conferred the rank of Field marshal, a five-star ranked general, which is a ceremonial position of great honour. The Indian Army originated from the armies of the East India Company, which eventually became the British Indian Army and finally the national army after independence. The units and regiments of the Indian Army have diverse histories and have participated in a number of battles and campaigns across the world, earning a large number of battle and theatre honours before and after Independence. The Indian Army has a regimental system, but is operationally and geographically divided into seven commands, with the basic field formation being a division. It is an all-volunteer force and comprises more than 80% of the country’s active defence personnel. It is one of the largest standing armies in the world, with 1,129,900 active troops and 960,000 reserve troops. The army has embarked on an infantry modernization program known as Futuristic Infantry Soldier As a System (F-INSAS), and is also upgrading and acquiring new assets for its armoured, artillery and aviation branches. With the Charter Act of 1833, the Secretariat of the Government of the East India Company was reorganised into four Departments, including a Military Department. The army in the Presidencies of Bengal, Bombay & Madras functioned as respective Presidency Army until April 1895, when the Presidency Armies were unified into a single Indian Army. For administrative convenience, it was divided into four commands at that point of time, namely Punjab (including the North West Frontier), Bengal, Madras (including Burma) and Bombay (including Sind, Quetta and Aden). The British Indian Army was a critical force for the primacy of the British Empire both in India and across the world. Besides maintaining the internal security of the British Raj, the Army fought in many other theatres – Anglo-Burmese Wars, First and Second Anglo-Sikh Wars, First, Second and Third Anglo-Afghan Wars, First and Second Opium Wars in China, Abyssinia, Boxer Rebellion in China. French postcard depicting the arrival of 15th Sikh Regiment in France during World War I. The postcard reads, "Gentlemen of India marching to chasten the German hooligans". In the 20th century, the Indian Army was a crucial adjunct to the British forces in both the World Wars. 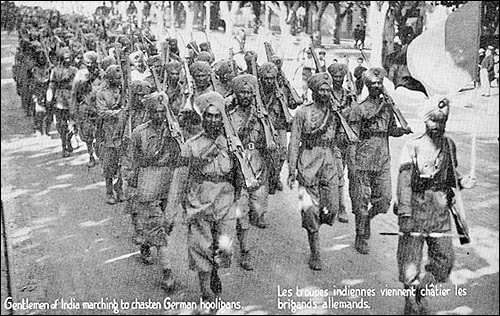 1.3 million Indian soldiers served in World War I (1914–1918) for the Allies, after the United Kingdom made vague promises of self-governance to the Indian National Congress in return for its support. Britain reneged on its promises after the war, following which the Indian Independence movement gained strength. 74,187 Indian troops were killed or missing in action in the war. The "Indianisation" of the British Indian Army began with the formation of the Prince of Wales Royal Indian Military College at Dehradun in March 1912 with the purpose of providing education to the scions of aristocratic and well-to-do Indian families and to prepare selected Indian boys for admission into the Royal Military College, Sandhurst. Indian officers given a King's commission after passing out were posted to one of the eight units selected for Indianisation. Political pressure being applied due to the slow pace of Indianisation, with just 69 officers being commissioned between 1918 and 1932, led to the formation of the Indian Military Academy in 1932 and greater numbers of officers of Indian origin being commissioned. In World War II Indian soldiers fought for the Allies. In 1939, British officials had no plan for expansion and training of Indian forces, which comprised about 130,000 men (in addition there were 44,000 men in British units in India in 1939). Their mission was internal security and defence against a possible Soviet threat through Afghanistan. As the war progressed, the size and role of the Indian Army expanded dramatically, and troops were sent to battle fronts as soon as possible. The most serious problem was lack of equipment. 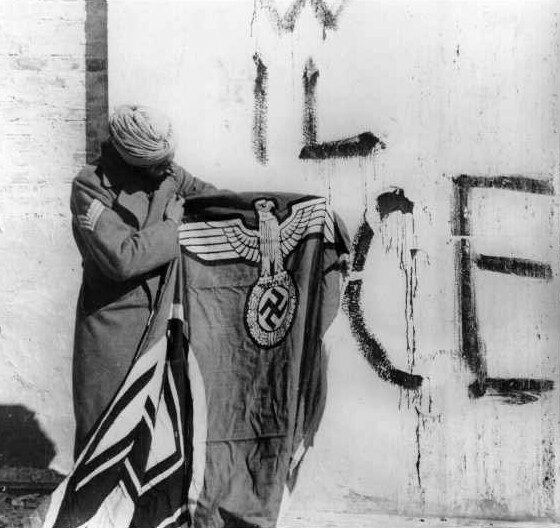 In the African and Middle-Eastern Campaigns, captured Indian troops were given a choice to join the German Army to eventually "liberate" India from Great Britain instead of being sent to POW camps. These men, along with Indian students who were in Germany when the war broke out, made up what was called the Free India Legion. They were originally intended as pathfinders for German forces in Asia but they soon were sent to help guard the Atlantic Wall. Few who were part of the Free India Legion ever saw any combat and very few were ever stationed outside of Europe. At its height the Free India Legion had over 3,000 troops in its ranks. Indian units served in Burma, where in 1944–45 five Indian divisions were engaged along with one British and three African divisions. Even larger numbers operated in the Middle East. Some 87,000 Indian soldiers died in the war. Elements of British Indian army played important part in Indian independence movement. In the 1915 Singapore Mutiny and in World War Two, thousands of British Indian army soldiers rose up and fought against British, most importantly by joining the Indian National Army, which was allied with the Empire of Japan, led by Netaji Subhas Chandra Bose and Rash Bihari Bose. With the fall of Singapore in 1942, about 40,000 Indian soldiers were captured. They were given a choice and over 30,000 joined the Indian National Army. Those who refused became POWs and were mostly shipped to New Guinea. After initial success it was defeated along with Japanese but it had huge impact on Indian independence movement. Similar organisations were also made in Germany and Japan. In 1946 Indian sailors revolted against British which resulted in 1946 British Indian Navy Mutiny. Upon independence and the subsequent Partition of India in 1947, four of the ten Gurkha regiments were transferred to the British Army. The rest of the British Indian Army was divided between the newly created nations of Republic of India and Republic of Pakistan. The Punjab Boundary Force, which had been formed to help police the Punjab during the partition period, was disbanded, and Headquarters Delhi and East Punjab Command was formed to administer the area. Immediately after independence, tensions between India and Pakistan began to boil over, and the first of three full-scale wars between the two nations broke out over the then princely state of Kashmir. The Maharaja of Kashmir wanted to have stand still position. Since, Kashmir was Muslim majority state, Pakistan wanted to make Kashmir a Pakistani territory. In 1948, Pakistan invaded Kashmir, as a result, Maharaja Hari Singh appealed to India, and to Lord Mountbatten of Burma, the Governor General, for help. He signed the Instrument of Accession to India. This Accession was warmly supported by local people. It took 2 weeks for Indian forces to reach war front. Indian troops were airlifted to Srinagar. This contingent included General Thimayya who distinguished himself in the operation and in years that followed, became a Chief of the Indian Army. An intense war was waged across the state and former comrades found themselves fighting each other. Pakistan suffered significant losses. Its forces were stopped on the line formed which is now called LOC (Line of Control). An uneasy UN sponsored peace returned by the end of 1948 with Indian and Pakistani soldiers facing each other directly on the Line of Control, which has since divided Indian-held Kashmir from Pakistan-held Kashmir. A host of UN Resolutions(38–47) were passed calling for a plebiscite to be held in Kashmir to determine accession to India or Pakistan. These Resolutions however were never accepted by India. Tensions between India and Pakistan, largely over Kashmir, have never since been entirely eliminated. After the partition of India, the State of Hyderabad, a princely state under the rule of a Nizam, chose to remain independent. The Nizam, refused to accede his state to the Union of India. The following stand-off between the Government of India and the Nizam ended on 12 September 1948 when India's then deputy prime minister Sardar Vallabhbhai Patel ordered Indian troops to secure the state. With 5 days of low-intensity fighting, the Indian Army, backed by a squadron of Hawker Tempest aircraft of the Indian Air Force, routed the Hyderabad State forces. Five infantry battalions and one armoured squadron of the Indian Army were engaged in the operation. The following day, the State of Hyderabad was proclaimed as a part of the Union of India. Major General Joyanto Nath Chaudhuri, who led the Operation Polo was appointed the Military Governor of Hyderabad (1948–1949) to restore law and order. During the Korean War, India sent the 60th (Parachute) Field Ambulance unit to aid the UN troops fighting against the Chinese and North Korean invasion of South Korea, though they decided against sending combat forces. The 60th PFA was included in the 1st Commonwealth Division. In the aftermath of the war, Indian soldiers were also sent to Korea to peace-keep. Even though the British and French vacated all their colonial possessions in the Indian subcontinent, Portugal refused to relinquish control of its Indian colonies of Goa, Daman and Diu. After repeated attempts by India to negotiate with Portugal for the territory were spurned by Portuguese prime minister and dictator, Antonio de Oliveira Salazar, India launched Operation Vijay on 12 December 1961 to take Goa from the Portuguese. A small contingent of its troops entered Goa, Daman and Diu to capture and secure the territory. After a brief conflict, in which 31 Portuguese soldiers were killed, the Portuguese Navy frigate NRP Afonso de Albuquerque destroyed, and over 3,000 Portuguese captured, Portuguese General Manuel António Vassalo e Silva surrendered to Maj Gen KP Candeth (Kunhiraman Palat Kandoth) of the Indian Army, after twenty-six hours and Goa, Daman and Diu joined the Indian Union. The cause of the war was a dispute over the sovereignty of the widely separated Aksai Chin and Arunachal Pradesh border regions. Aksai Chin, claimed by India to belong to Kashmir and by China to be part of Xinjiang, contains an important road link that connects the Chinese regions of Tibet and Xinjiang. China's construction of this road was one of the triggers of the conflict. Small-scale clashes between the Indian and Chinese forces broke out as India insisted on the disputed McMahon Line being regarded as the international border between the two countries. Chinese troops claim to have not retaliated to the cross-border firing by Indian troops, despite sustaining losses. China's suspicion of India's involvement in Tibet created more rifts between the two countries. In 1962, the Indian Army was ordered to move to the Thag La ridge located near the border between Bhutan and Arunachal Pradesh and about three miles (5 km) north of the disputed McMahon Line. Meanwhile, Chinese troops too had made incursions into Indian-held territory and tensions between the two reached a new high when Indian forces discovered a road constructed by China in Aksai Chin. After a series of failed negotiations, the People's Liberation Army attacked Indian Army positions at the Thag La ridge. This move by China caught India by surprise and by 12 October, Nehru gave orders for the Chinese to be expelled from Aksai Chin. However, poor coordination among various divisions of the Indian Army and the late decision to mobilise the Indian Air Force in vast numbers gave China a crucial tactical and strategic advantage over India. On 20 October, Chinese soldiers attacked India in both the North-West and North-Eastern parts of the border and captured vast portions of Aksai Chin and Arunachal Pradesh. As the fighting moved beyond disputed territories, China called on the Indian government to negotiate, however India remained determined to regain lost territory. With no peaceful agreement in sight, China unilaterally withdrew its forces from Arunachal Pradesh. The reasons for the withdrawal are disputed with India claiming various logistical problems for China and diplomatic support to it from the United States, while China stated that it still held territory that it had staked diplomatic claim upon. The dividing line between the Indian and Chinese forces was named the Line of Actual Control. The poor decisions made by India's military commanders, and, indeed, its political leadership, raised several questions. The Henderson-Brooks & Bhagat committee was soon set up by the Government of India to determine the causes of the poor performance of the Indian Army. The report of China even after hostilities began and also criticised the decision to not allow the Indian Air Force to target Chinese transport lines out of fear of Chinese aerial counter-attack on Indian civilian areas. Much of the blame was also targeted at the incompetence of then Defence Minister, Krishna Menon who resigned from his post soon after the war ended. Despite frequent calls for its release, the Henderson-Brooks report still remains classified. Neville Maxwell has written an account of the war. A second confrontation with Pakistan took place in 1965, largely over Kashmir. Pakistani President Ayub Khan launched Operation Gibraltar in August 1965, during which several Pakistani paramilitary troops infiltrated into Indian-administered Kashmir and attempt to ignite an anti-India agitation in Jammu and Kashmir. Pakistani leaders believed that India, which was still recovering from the disastrous Sino-Indian War, would be unable to deal with a military thrust and a Kashmiri rebellion. India reacted swiftly and launched a counter offensive on Pakistan. Pakistan launched Operation Grand Slam in reply on 1 September, invading India's Chamb-Jaurian sector. In retaliation, the India's Army launched a major offensive throughout its border with Pakistan, with Lahore as its prime target. At the time of ceasefire declaration, India reported casualties of about 3,000 killed. On the other hand, it was estimated that more than 4,000 Pakistani soldiers were killed in the battle. About 471 Pakistani tanks were either destroyed or captured by India. India lost a total of 128 tanks during the conflict. The decision to return to pre-war positions, following the Tashkent Declaration, caused an outcry among the polity in New Delhi. It was widely believed that India's decision to accept the ceasefire was due to political factors, and not military, since it was facing considerable pressure from the United States and the UN to stop hostilities. The 1967 Sino-Indian skirmish also known as the Chola incident, was a day-long military conflict between Indian troops and troops of the Chinese People's Liberation Army in Sikkim, who had infiltrated the area. During this war China attempted to conquer Sikkim, but suffered from higher casualties. The end of the battle saw the Chinese Army leave Sikkim. An independence movement broke out in East Pakistan which was brutally crushed by Pakistani forces. Due to large-scale atrocities against them, thousands of Bengalis took refuge in neighbouring India causing a major refugee crisis there. In early 1971, India declared its full-support for the Bengali rebels, known as Mukti Bahini, and Indian agents were extensively involved in covert operations to aid them. On 20 November 1971, Indian Army moved the 14 Punjab Battalion 45 Cavalry into Garibpur, a strategically important town near India's border with East Pakistan, and successfully captured it. The following day, more clashes took place between Indian and Pakistani forces. Wary of India's growing involvement in the Bengali rebellion, the Pakistan Air Force (PAF) launched a preemptive strike on 10 Indian air bases at Srinagar, Jammu, Pathankot, Amritsar, Agra, Adampur, Jodhpur, Jaisalmer, Uttarlai and Sirsa at 1745 hours on 3 December. This aerial offensive, however, failed to accomplish its stated objectives and gave India its excuse to declare a full-scale war against Pakistan the same day. By midnight, the Indian Army, accompanied by Indian Air Force, launched a major three-pronged assault into East Pakistan. The Indian Army won several battles on the eastern front including the decisive of battle of Hilli, which was the only front where the Pakistani Army was able to build up considerable resistance. The operation also included a battalion-level airborne operation on Tangail which resulted in the capitulation of all resistance within five days. India's massive early gains was largely attributed to the speed and flexibility with which Indian armoured divisions moved across East Pakistan. Pakistan launched a counter-attack against India on the western front. On 4 December 1971, the A company of the 23rd Battalion of India's Punjab Regiment detected and intercepted the movement of the 51st Infantry Brigade of the Pakistani Army near Ramgarh, Rajasthan. The battle of Longewala ensued during which the A company, though being outnumbered, thwarted the Pakistani advance until the Indian Air Force directed its fighters to engage the Pakistani tanks. By the time the battle had ended, 38 Pakistani tanks and 100 armoured vehicles were either destroyed or abandoned. About 200 Pakistani troops were killed in action during the battle while only 2 Indian soldiers lost their lives. Pakistan suffered another major defeat on the western front during the battle of Basantar which was fought from 4 December to 16th. By the end of the battle, about 66 Pakistani tanks were destroyed and 40 more were captured. In return, Pakistani forces were able to destroy only 11 Indian tanks. None of the numerous Pakistani offensives on the Western front materialised. By 16 December, Pakistan had lost sizeable territory on both eastern and western fronts. Under the command of Lt. General J.S. Arora, the three corps of the Indian Army, which had invaded East Pakistan, entered Dhaka and forced Pakistani forces to surrender on 16 December 1971, one day after the conclusion of the battle of Basantar. After Pakistan's Lt. General A.A.K. Niazi signed the Instrument of Surrender, India took more than 90,000 Pakistani prisoners of war. At the time of the signing of the Instrument of Surrender, 11,000 Pakistani soldiers were killed-in-action while India suffered only 3,500 battle-related deaths. In addition, Pakistan lost 220 tanks during the battle compared to India's 69. In 1972, the Simla Agreement was signed between the two countries and tensions simmered. However, there were occasional spurts in diplomatic tensions which culminated into increased military vigilance on both sides. The Siachen Glacier, though a part of the Kashmir region, was not officially demarcated on maps prepared and exchanged between the two sides in 1947. As a consequence, prior to the 1980s, neither India nor Pakistan maintained any permanent military presence in the region. However, Pakistan began conducting and allowing a series of mountaineering expeditions to the glacier beginning in the 1950s. By early 1980s, the government of Pakistan was granting special expedition permits to mountaineers and United States Army maps deliberately showed Siachen as a part of Pakistan. This practice gave rise to the contemporary meaning of the term oropolitics. India, possibly irked by these developments, launched Operation Meghdoot in April 1984. The entire Kumaon Regiment of the Indian Army was airlifted to the glacier. Pakistani forces responded quickly and clashes between the two followed. Indian Army secured the strategic Sia La and Bilafond La mountain passes and by 1985, more than 1,000 square miles (2,600 km2) of territory, 'claimed' by Pakistan, was under Indian control. The Indian Army continues to control all of the Siachen Glacier and its tributary glaciers. Pakistan made several unsuccessful attempts to regain control over Siachen. In late 1987, Pakistan mobilised about 8,000 troops and garrisoned them near Khapalu, aiming to capture Bilafond La. However, they were repulsed by Indian Army personnel guarding Bilafond. During the battle, about 23 Indian soldiers lost their lives while more than 150 Pakistani troops perished. Further unsuccessful attempts to reclaim positions were launched by Pakistan in 1990, 1995, 1996 and 1999, most notably in Kargil that year. India continues to maintain a strong military presence in the region despite extremely inhospitable conditions. The conflict over Siachen is regularly cited as an example of mountain warfare. The highest peak in the Siachen glacier region, Saltoro Kangri, could be viewed as strategically important for India because of its immense altitude which could enable the Indian forces to monitor some Pakistani or Chinese movements in the immediate area. Maintaining control over Siachen poses several logistical challenges for the Indian Army. Several infrastructure projects were constructed in the region, including a helipad 21,000 feet (6,400 m) above the sea level. In 2004, Indian Army was spending an estimated US$2 million a day to support its personnel stationed in the region. The Indian Army has played a crucial role in the past, fighting insurgents and terrorists within the nation. The army launched Operation Blue Star and Operation Woodrose in the 1980s to combat Sikh insurgents. The army, along with some paramilitary forces, has the prime responsibility of maintaining law and order in the troubled Jammu and Kashmir region. The Indian Army also sent a contingent to Sri Lanka in 1987 as a part of the Indian Peace Keeping Force. Operation Sadbhavana (meaning Goodwill), launched in 1998, is a part of Military Civic Action programmes aimed at ‘Wining the Hearts and Minds” of the people in Jammu and Kashmir and North Eastern States, as part of a strategy for conflict resolution . From 1998 to 2008, a total of Rs. 276.08 crore, allocated by the Ministry of Defence (MoD), was spent on various multi-faceted activities under this operation. The scope of the operation includes infrastructure, health care,education (including Information Technology Assistance), human resources development and national integration tours. Between 2010 and 2012, Sadbhavana, under Lt.Gen. Syed Ata Hasnain reached out to the people like no other army officer had done before. From Ji Janaab — a doctrine formulated to make the army troops aware of local forms of address and cultural sensitivities and to put them into practice while dealing with the civilian population — to the hugely popular awami sunwais, public hearings at which people were encouraged to vent their angst about everything that bothered them, including the army, initiatives implemented under the umbrella of Sadbhavana, drew widespread praise from the Centre and State. As many as 350 T20 cricket matches were organised across all 10 districts of Kashmir. The idea was to use sport to prevent youngsters from taking to violence. A sum of Rs.1.4 crore from Sadbhavana funds was spent on organising KPL. In 1998, India carried out nuclear tests and a few days later, Pakistan responded by more nuclear tests giving both countries nuclear deterrence capability, although India had exploded three hydrogen bombs which Pakistan lacks. Diplomatic tensions eased after the Lahore Summit was held in 1999. The sense of optimism was short-lived, however, since in mid-1999 Pakistani paramilitary forces and Kashmiri insurgents captured deserted, but strategic, Himalayan heights in the Kargil district of India. These had been vacated by the Indian army during the onset of the inhospitable winter and were supposed to reoccupied in spring. The regular Pakistani troops who took control of these areas received important support, both in the form of arms and supplies, from Pakistan. Some of the heights under their control, which also included the Tiger Hill, overlooked the vital Srinagar-Leh Highway (NH 1A), Batalik and Dras. Once the scale of the Pakistani incursion was realised, the Indian Army quickly mobilised about 200,000 troops and Operation Vijay was launched. However, since the heights were under Pakistani control, India was in a clear strategic disadvantage. From their observation posts, the Pakistani forces had a clear line-of-sight to lay down indirect artillery fire on NH 1A, inflicting heavy casualties on the Indians. This was a serious problem for the Indian Army as the highway was its main logistical and supply route. Thus, the Indian Army's first priority was to recapture peaks that were in the immediate vicinity of NH1a. This resulted in Indian troops first targeting the Tiger Hill and Tololing complex in Dras. This was soon followed by more attacks on the Batalik-Turtok sub-sector which provided access to Siachen Glacier. Point 4590, which had the nearest view of the NH1a, was successfully recaptured by Indian forces on 14 June. Though most of the posts in the vicinity of the highway were cleared by mid-June, some parts of the highway near Drass witnessed sporadic shelling until the end of the war. Once NH1a area was cleared, the Indian Army turned to driving the invading force back across the Line of Control. The Battle of Tololing, among other assaults, slowly tilted the combat in India's favour. Nevertheless, some of the posts put up a stiff resistance, including Tiger Hill (Point 5140) that fell only later in the war. As the operation was fully underway, about 250 artillery guns were brought in to clear the infiltrators in the posts that were in the line-of-sight. In many vital points, neither artillery nor air power could dislodge the outposts manned by the Pakistan soldiers, who were out of visible range. The Indian Army mounted some direct frontal ground assaults which were slow and took a heavy toll given the steep ascent that had to be made on peaks as high as 18,000 feet (5,500 m). Two months into the conflict, Indian troops had slowly retaken most of the ridges they had lost; according to official count, an estimated 75%–80% of the intruded area and nearly all high ground was back under Indian control. Following the Washington accord on 4 July, where Sharif agreed to withdraw Pakistani troops, most of the fighting came to a gradual halt, but some Pakistani forces remained in positions on the Indian side of the LOC. In addition, the United Jihad Council (an umbrella for all extremist groups) rejected Pakistan's plan for a climb-down, instead deciding to fight on. The Indian Army launched its final attacks in the last week of July; as soon as the Drass subsector had been cleared of Pakistani forces, the fighting ceased on 26 July. The day has since been marked as Kargil Vijay Diwas (Kargil Victory Day) in India. By the end of the war, India had resumed control of all territory south and east of the Line of Control, as was established in July 1972 per the Shimla Accord. By the time all hostilities had ended, the number of Indian soldiers killed during the conflict stood at 527. while more than 700 regular members of the Pakistani army were killed. The number of Islamist fighters, also known as Mujahideen, killed by Indian Armed Forces during the conflict stood at about 3,000. The Indian Army has undertaken numerous UN peacekeeping missions: The Indian army also provided paramedical units to facilitate the withdrawal of the sick and wounded in the Korean War. Operation Brasstacks was launched by the Indian Army in November 1986 to simulate a full-scale war on the western border. The exercise was the largest ever conducted in India and comprised nine infantry, three mechanised, three armoured and one air assault division, and included three independent armoured brigades. Amphibious assault exercises were also conducted with the Indian Navy. Brasstacks also allegedly incorporated nuclear attack drills. It led to tensions with Pakistan and a subsequent rapprochement in mid-1987. Coalition color guard during Yudh Abhyas 2013. The seventh edition of Yudh Abhyas is currently underway since 5 March 2012 in two locations under the South Western Command. The US Army contingent is from the US Army Pacific (USARPAC), part of their Pacific Command (PACOM). The Command Post Exercise has an engineer brigade headquarters with its planners from both sides, while the Field Training Exercise comprises troops of 2nd Squadron 14th US Cavalry Regiment from 25th Infantry Division, Hawaii, along with a platoon of Strykers, and a similar sized Indian Army contingent of mechanised infantry. The event is all the more interesting as a number of key surveillance, communications and Improvised Explosive Devices detection and neutralisation technologies, available with both sides have been fielded in the exercise. Exercise Shakti is an ongoing series of joint exercises between the Indian and French armies since 2011. Exercise Shakti is conducted to practice and validate anti terrorist operations and drills in snowbound and mountainous areas. The second joint military exercise between the two countries was held in September 2013 with the first one being held in India in October 2011. The theme of the exercise is to conduct platoon level joint counter insurgency operations in high altitude mountainous terrain under the UN Charter, thus emphasizing the shared concerns of both countries about global terrorism. An added aim of the exercise is to qualitatively enhance knowledge of each other's military procedures thus increasing the scope for interoperability and better responsiveness to a common threat. The twelve day exercise with France Army is scheduled to be conducted in multiple modules in order to achieve complete integration between the two contingents at every stage. On first week of April 2012 Indian Army has launched a massive summer exercise in the Rajasthan desert involving over 50,000 troops and several hundred artillery guns and infantry combat vehicles as part of its efforts to shore up its battle worthiness on the western front with Pakistan. The exercise, code-named "Shoorveer", is being conducted by the Jaipur-based South Western Command and will end in the first week of May. This is the largest ever exercise conducted by Indian army since 1947. The collective training started with honing up of basic battle procedures and tactical drills at tactical level. A number of field firings are being carried out to check the accuracy and lethality of the weapon systems. A large number of innovations and modifications carried out by units and formations to enhance combat power are being tested in the field. The troops will build the momentum of training gradually, with increased combat tempo to set the stage for a major joint army-air force exercise in the later part of the exercise. In May 2012 Indian army start testing the preparedness level of its units and to validate new age technology, battle concepts, organisational structures and networked operations, Western Army Command is conducting its summer training exercises in Punjab and Jammu and Kashmir. "Codenamed Exercise Rudra Akrosh, the war games are aimed to validate the operational and transformational effectiveness of various formations under the Western Army Command. The exercise which entered its culmination phase was also witnessed by Western Army Commander Lt General S R Ghosh. It includes various summer training manoeuvres where approximately 20,000 troops tested battle skills with state-of-the-art weapon systems in complete integration of the fighter and transport aircraft pitched in by the Indian Air Force. Besides interacting with the soldiers and officers coordinating the war games, Lt Gen Ghosh witnessed various battle manoeuvres by infantry troops, mechanised infantry, tanks, artillery, Heliborne troops and surveillance equipment. Unmanned Aerial Vehicles (UAVs) and attack helicopters were also coopted in the operational scenario. Recently, the Jaipur-based South Western Command- also known as Sapta Shakti command- conducted its summer war games with more than 50,000 troops, latest weaponry and air assets. The current combat doctrine of the Indian Army is based on effectively utilising holding formations and strike formations. In the case of an attack, the holding formations would contain the enemy and strike formations would counter-attack to neutralise enemy forces. In the case of an Indian attack, the holding formations would pin enemy forces down whilst the strike formations attack at a point of Indian choosing. The Indian Army is large enough to devote several corps to the strike role. Currently, the army is also looking at enhancing its special forces capabilities. With the role of India increasing and the requirement for protection of India's interest in far off shores become important, the Indian Army and Indian Navy are jointly planning to set up a marine brigade. The Indian Army is a voluntary service and although a provision for military conscription exists in the Indian constitution, it has never been imposed. According to the International Institute for Strategic Studies, in 2010 the army had a strength of 1,129,900 active personnel and 960,000 reserve personnel. Of those in reserve 160,000 were in the Indian Territorial Army, however only 40,000 of those regularly report for duty. This makes the Indian Army the world's largest standing volunteer army. The various rank of the Indian Army can be found listed at, Army ranks and insignia of India. Upon its inception, the Indian Army inherited the British Army's organizational structure which is still maintained today. Therefore, like its predecessor, an Indian Infantry Regiment's responsibility is not to undertake field operations but to provide battalions and well trained personnel to the field formations, as such it is common to find battalions of the same regiment spread across several brigades, divisions, corps, commands, and even theatres. Infantry Regiments of the Indian Army recruit based on certain selection criteria, such as on regional, ethnicity or religion such as the Assam Regiment, Jat Regiment and Sikh Regiment respectively. Over the years various political and military factions have tried to dissolve the unique selection criteria process of the regiments over a fear that loyalty to the regiment or its ethnic people opposed to loyalty to the union of India and have succeeded somewhat with the creation of ethnic-less, religion-less, non-regional regiments, such as the Brigade of Guards & Parachute Regiment, but have generally met with little success or gained popular support amongst the rank and file Jawans. Like its British and commonwealth counterparts troops enlisted within the regiment are immensely loyal and take great pride in the regiment to which they are assigned and generally spend their entire career within the regiment. The Regiment of Artillery constitutes a formidable operational arm of Indian Army. Historically it takes its lineage from Moghul Emperor Babur who is popularly credited with introduction of Artillery in India, in the Battle of Panipat in 1526. However evidence of earlier use of gun by Bahmani Kings in the Battle of Adoni in 1368 and King Mohammed Shah of Gujrat in fifteenth century have been recorded. 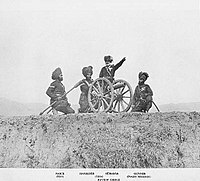 Indian artillery units were disbanded after the 1857 rebellion and reformed only in 1935 when the Regiment was established. There are 63 armoured regiments in the Indian Army. These include the following historic regiments dating back to the nineteenth century or earlier: 1st (Skinner's) Horse, the 2nd Lancers (Gardner's Horse), 3rd Cavalry, 4th (Hodson's) Horse, 7th Light Cavalry, 8th Light Cavalry, 9th (Deccan) Horse, 14th (Scinde) Horse, 17th (Poona) Horse, 15th Lancers, 16th Light Cavalry, 18th Cavalry, 20th Lancers, and the 21st (Central India) Horse. A substantial number of additional units designated as either "Cavalry" or "Armoured" Regiments have been raised since Independence. Uniform of the Assam Regiment. Most of the army equipment is imported, but efforts are being made to manufacture indigenous equipment. The Defence Research and Development Organisation has developed a range of weapons for the Indian Army ranging from small arms, artillery, radars and the Arjun tank. All Indian Military small-arms are manufactured under the umbrella administration of the Ordnance Factories Board, with principal Firearm manufacturing facilities in Ichhapore, Cossipore, Kanpur, Jabalpur and Tiruchirapalli. The Indian National Small Arms System (INSAS) rifle, which is successfully inducted by Indian Army since 1997 is a product of the Ishapore Rifle Factory, while ammunition is manufactured at Khadki and possibly at Bolangir. Aircraft - The Army Aviation Corps is the main body of the Indian Army for tactical air transport, reconnaissance, and medical evacuation, while Indian Air Force's helicopter assets are responsible for assisting the army troop transport and close air support. It operates around 150 helicopters. The Indian army had projected a requirement for a helicopter that can carry loads of up to 750 kg heights of 23,000 feet (7,000 m) on the Siachen Glacier in Jammu and Kashmir. Flying at these heights poses unique challenges due to the rarefied atmosphere. The Indian Army chose the Eurocopter AS 550 for a $550 million contract for 197 light helicopters to replace its ageing fleet of Chetaks and Cheetahs, some of which were inducted more than three decades ago. The deal has however, been scrapped amidst allegations of corruption during the bidding process. On 13 Oct 2012, The defence minister has given the control of attack helicopters to Indian Army from Indian Air force. Uniforms - The Indian Army camouflage consists of shirts, trousers and cap of a synthetic material. Shirts are buttoned up with two chest pockets with buttoned up flaps. Trousers have two pockets, two thigh box pockets and a back pocket. The Indian Army Jungle camouflage dress features a jungle camouflage pattern and is designed for use in woodland environments. The Indian Army Desert camouflage, which features a desert camouflage pattern, is used by artillery and infantry posted in dusty, semi-desert and desert areas of Rajasthan and its vicinity. The forces of the East India Company in India were forced by casualties to dye their white summer tunics to neutral tones, initially a tan called khaki (from the Hindi-Urdu word for "dusty"). This was a temporary measure which became standard in Indian service in the 1880s. Only during the Second Boer War in 1902, did the entire British Army standardise on dun for Service Dress. Indian Army uniform standardises on dun for khaki. The modern Indian Army wears distinctive parade uniforms characterised by variegated turbans and waist-sashes in regimental colours. The Gurkha and Garwhal Rifles and the Assam, Kumaon and the Naga Regiments wear broad brimmed hats of traditional style. Traditionally, all Rifle regiments and the Jammu and Kashmir Light Infantry (Jammu and Kashmir Rifles, Garhwal Rifles, Gurkha Rifles, and Rajputana Rifles) wear rank badges, buttons and blackened wire embroidered articles of uniform in black instead of the usual Brass (or gold) coloured as the original role of the rifle regiments was camouflage and concealment. The Directorate of Military Intelligence (DMI) is the Intelligence arm of the Indian Army. The MI (as it is commonly referred to) was constituted in 1941 and was initially created to check corruption in the Army's own ranks. With time, its role has evolved into cross border intelligence, intelligence sharing with friendly nations, infiltrating insurgent groups and counter-terrorism. In the late 1970s, the MI was embroiled in the Samba spy scandal wherein 3 Indian Army officers were falsely implicated as Pakistani spies. The organisation has since emerged from the scandal as a prime Intelligence organisation of the Indian Army. As of 2012, the MI has seen many of its roles taken away in a turf war with the newly created National Technical Research Organisation and Defence Intelligence Agency. The army has a strength of about a million troops and fields 34 divisions. Its headquarters is located in the Indian capital New Delhi and it is under the overall command of the Chief of Army Staff (COAS), currently General Bikram Singh, PVSM, UYSM, AVSM, SM, VSM, ADC. Initially, the army's main objective was to defend the nation's frontiers. However, over the years, the army has also taken up the responsibility of providing internal security, especially in insurgent-hit Kashmir and the Northeast. Recently it has been proposed to enhance the strength of the army by more than 90,000 to counter the increasing presence of Chinese troops along the LAC. Division: Each Division is headed by General Officer Commanding (GOC) in the rank of Major General. It usually consists of 15,000 combat troops and 8,000 support elements. Currently, the Indian Army has 37 Divisions including; 4 RAPID's (Re-organised Army Plains Infantry Division), 18 Infantry Divisions, 10 Mountain Divisions, 3 Armoured Divisions and 2 Artillery Divisions. Each Division composes of several Brigades. Brigade: A Brigade generally consists of around 3,000 combat troops with supporting elements. An Infantry Brigade usually has 3 Infantry Battalions along with various Support Arms & Services. It is headed by a Brigadier, equivalent to a Brigadier General in some armies. In addition to the Brigades in various Army Divisions, the Indian Army also has 5 Independent Armoured Brigades, 15 Independent Artillery Brigades, 7 Independent Infantry Brigades, 1 Independent Parachute Brigade,3 Independent Air Defence Brigades, 2 Independent Air Defence Groups and 4 Independent Engineer Brigades. These Independent Brigades operate directly under the Corps Commander (GOC Corps). Battalion: A Battalion is commanded by a Colonel and is the Infantry's main fighting unit. It consists of more than 900 combat personnel. Company: Headed by the Major or Captain, a company comprises 120 soldiers. Platoon: An intermediate between a company and section, a platoon is headed by a Captain or Lieutenant, or depending on the availability of commissioned officers, even a junior commissioned officer (Subedar). It has a total strength of about 32 troops. Section: Smallest military outfit with a strength of 10 personnel. Commanded by a non-commissioned officer of the rank of Havildar or Sergeant. The army operates 7 operational commands. Each command is headed by General Officer Commanding-in-Chief with the rank of Lieutenant General. Each command is directly affiliated to the Army HQ in New Delhi. These commands are given below in their correct order of raising, location (city) and their commanders. There is also the Army Training Commanded abbreviated as ARTRAC. The staff in each Command HQ is headed by Chief of Staff (COS) who is also an officer of Lieutenant General rank. Besides these, army officers may head tri-service commands such as the Strategic Forces Command, Integrated Defence Staff (IDS) and the Andaman and Nicobar Command. A corps is an army field formation responsible for a zone within a command theatre. There are three types of corps in the Indian Army: Strike, Holding and Mixed. A command generally consists of two or more corps. A corps has Army divisions under its command. The Corps HQ is the highest field formation in the army. Corps of Signals – Military College of Telecommunication Engineering (MCTE), Mhow is a premiere training institute for the officers of the Corps of Signals. The corps also has two Signal Training Centres at Jabalpur and Belgaum. Corps of Engineers – The College of Military Engineering is at Dapodi, Pune. The centers are located as follows – Madras Engineer Group at Bangalore, Bengal Engineer Group at Roorkee and Bombay Engineer Group at Khadki, Pune. Corps of Army Air Defence - Center at Gopalpur in Orissa State. Mechanised Infantry – Regimental Center at Ahmednagar. F-INSAS is the Indian Army's principal infantry modernisation program, which aims to modernise the army's 465 infantry and paramilitary battalions by 2020. The programme aims to upgrade the infantry with a multi-calibre rifle with an under-barrel grenade launcher and bullet-proof jackets and helmets. The helmet would include a visor, flash light, thermal sensors, night vision devices and a miniature computer with audio headsets. It will also include a new lightweight and water-proof uniform, which would help the soldier in carrying extra load and fighting in an NBC environment. India is currently re-organising its mechanised forces to achieve strategic mobility and high-volume firepower for rapid thrusts into enemy territory. India proposes to progressively induct as many as 248 Arjun MBT and develop and induct the Arjun MK-II variant, 1,657 Russian-origin T-90S main-battle tanks (MBTs), apart from the ongoing upgrade of its T-72 fleet. The army is procuring 2,000 pieces of night vision devices for T-72 tanks for Rs 1,000 crore; 1,200 pieces for T-90 tanks for Rs 960 crore and 1,780 pieces for infantry combat vehicles for Rs 860 crore. It is also acquiring 700 TISAS (thermal imaging stand alone systems) and 418 TIFACS (thermal fire control systems) for its T-72 fleet at a cost of around $230 million. 300 Israeli TISAS were installed as part of several T-72 upgrade phases, followed by 3,860 image intensifier-based night-vision devices. 310 Russian produced T-90S Main Battle Tanks were also fitted with French Catherine TI cameras. The Cabinet Committee on Security approved raising two new infantry mountain divisions (with around 15,000 combat soldiers each) and an artillery brigade in 2008. These divisions were likely to be armed with ultralight howitzers. In July 2009, it was reported that the Army was advocating a new artillery division. The proposed artillery division, under the Kolkata-based Eastern Command, was to have three brigades — two of 155 mm howitzers and one of the Russian "Smerch" and indigenous "Pinaka" multiple-launch rocket systems. Arjun MBT Mk. 2 – Trials started 2011. Production By 2014. FMBT – The FMBT will be a lighter tank of 50 tons. At conceptual stage. Army is planning to shelve it in favour of further development of Arjun MBT. FICV – Future Infantry Combat Vehicle program of DRDO. It is supposed to replace Indian Army's current regiment of BMP-2 infantry combat vehicle. Russia has offered to sell the BMP-3 to India if they cancel the program. Kroton – Possible sale of 80 mine laying vehicles from Poland. Agni-V – 5,000 km-6,000 km, Successfully Tested by DRDO on 19 April 2012 at 08.05 am IST. Agni-VI – 6000–10,000 km range with MIRVed warheads. Currently in planning stage. Prahaar (missile) – With a range of 150 km. Shaurya (missile) – It has a range of between 750 to 1900 km. Nag Anti-tank guided missile - ground and air-launched variant. The Indian Ballistic Missile Defense Program is an initiative to develop and deploy a multi-layered ballistic missile defence system to protect India from ballistic missile attacks. 20000 (US$3 billion). This includes purchasing 1580 towed, 814 mounted, 180 self-propelled wheeled, 100 self-propelled tracked and 145 ultra-light 155 mm/52 calibre artillery guns. The requirement for artillery guns would be met with indigenous development and production. 22000 (US$4 billion) were issued for assault rifles, carbines, pump-action shotguns, sniper rifles, anti-material rifles, general purpose machine guns and heavy machine guns. Procurement process for 197 light utility helicopters (LUH) is ongoing, of which 64 will be inducted in the Army Aviation to replace the Cheetak and Cheetah Helicopters. HAL Light Observation Helicopter (LOH) or Light Utility helicopter (LUH) – requirement for 384 helicopters for both the army and air force. ↑ 1.0 1.1 "General V K Singh takes over as new Indian Army chief". The Times of India. 31 March 2010. http://articles.timesofindia.indiatimes.com/2010-03-31/india/28144490_1_yudh-sena-medal-indian-army-rajput-regiment. Retrieved 31 March 2010. ↑ Singh, Sarbans (1993). Battle Honours of the Indian Army 1757 - 1971. New Delhi: Vision Books. ISBN 8170941156. ↑ Headquarters Army Training Command. "Indian Army Doctrine". October 2004. Archive link via archive.org (original url: http://indianarmy.nic.in/indianarmydoctrine_1.doc). ↑ First line reserves number 300,000, who are within 5 years of full time service. 500,000 more have commitment till the age of 50. ↑ The Military Balance 2010. Oxfordshire: Routledge. 2010. pp. 351, 359–364. ISBN 1857435575. ↑ "Indian Army Modernisation Needs a Major Push". February 2010. http://www.indiastrategic.in/topstories482.htm. Retrieved 10 July 2013. ↑ "India's Military Modernisation Up To 2027 Gets Approval". 2 April 2012. http://www.defencenow.com/news/611/indias-military-modernisation-up-to-2027-gets-approval.html. Retrieved 10 July 2013. ↑ "About The Ministry". Ministry of Defence, Government of India. http://mod.nic.in/aboutus/welcome.html. Retrieved 31 March 2011. ↑ Khanduri, Chandra B. (2006). Thimayya: an amazing life. New Delhi: Knowledge World. p. 394. ISBN 978-81-87966-36-4. http://books.google.co.in/books?id=ZWXfAAAAMAAJ. Retrieved 30 July 2010. ↑ Martin Bamber and Aad Neeven (26 August 1942). "The Free Indian Legion – Infantry Regiment 950 (Ind)". Freeindianlegion.info. http://www.freeindianlegion.info/pag_infanterie-regement-950.php. Retrieved 1 June 2012. ↑ "Indo-Pakistani War, 1947–1949". ACIG. 29 October 2003. http://www.acig.org/artman/publish/article_321.shtml. ↑ Bruce Bueno de Mesquita & David Lalman. War and Reason: Domestic and International Imperatives. Yale University Press (1994), p. 201. ISBN 978-0-300-05922-9. ↑ Alastair I. Johnston & Robert S. Ross. New Directions in the Study of China's Foreign Policy. Stanford University Press (2006), p. 99. ISBN 978-0-8047-5363-0. ↑ Claude Arpi. India and her neighbourhood: a French observer's views. Har-Anand Publications (2005), p. 186. ISBN 978-81-241-1097-3. ↑ 21.0 21.1 21.2 R.D. Pradhan & Yashwantrao Balwantrao Chavan (2007). 1965 War, the Inside Story: Defence Minister Y.B. Chavan's Diary of India-Pakistan War.. Atlantic Publishers & Distributors. p. 47. ISBN 978-81-269-0762-5. http://books.google.com/books?id=ymYCJQjEGBUC&pg=PA47. ↑ Sumit Ganguly. "Pakistan". In India: A Country Study (James Heitzman and Robert L. Worden, editors). Library of Congress Federal Research Division (September 1995). ↑ 23.0 23.1 "Indo-Pakistan Wars". Microsoft Encarta 2008. Archived 31 October 2009. ↑ Thomas M. Leonard. Encyclopedia of the developing world, Volume 2. Taylor & Francis, 2006. ISBN 0-415-97663-4, 9780415976633. ↑ Spencer Tucker. Tanks: An Illustrated History of Their Impact. ABC-CLIO (2004), p. 172. ISBN 978-1-57607-995-9. ↑ Sumit Ganguly. Conflict unending: India-Pakistan tensions since 1947. Columbia University Press (2002), p. 45. ISBN 978-0-231-12369-3. ↑ 50 years after Sino-Indian war | Millennium Post. Millenniumpost.in (1975-05-16). Retrieved on 2013-07-12. ↑ Owen Bennett Jones. Pakistan: Eye of the Storm. Yale University Press (2003), p. 177. ISBN 978-0-300-10147-8. ↑ Eric H. Arnett. Military capacity and the risk of war: China, India, Pakistan, and Iran. Oxford University Press (1997), p. 134. ISBN 978-0-19-829281-4. ↑ S. Paul Kapur. Dangerous deterrent: nuclear weapons proliferation and conflict in South Asia. Stanford University Press (2007), p. 17. ISBN 978-0-8047-5550-4. ↑ Encyclopedia of the Developing World, p. 806. ↑ Edward W. Desmond. "The Himalayas War at the Top Of the World". Time magazine (31 July 1989). ↑ Vivek Chadha. Low Intensity Conflicts in India: An Analysis. SAGE (2005), p. 105. ISBN 978-0-7619-3325-0. ↑ Pradeep Barua. The State at War in South Asia. University of Nebraska Press (2005), p. 256. ISBN 978-0-8032-1344-9. ↑ Tim McGirk with Aravind Adiga. "War at the Top of the World". Time magazine (4 May 2005). ↑ Sanjay Dutt. War and Peace in Kargil Sector. APH Publishing (2000), p. 389-90. ISBN 978-81-7648-151-9. ↑ Nick Easen. Siachen: The world's highest cold war. CNN (17 September 2003). ↑ Arun Bhattacharjee. "On Kashmir, hot air and trial balloons". Asia Times (23 September 2004). ↑ ""Aman Aur Jawan Aman Hai Muqam" OPERATION SADBHAVANA". http://pib.nic.in/newsite/erelease.aspx?relid=93711. Retrieved 28 September 2013. ↑ "Transformation of Conflict: An Analysis of "Op Sadbhavana" in Jammu and Kashmir". http://www.idsa.in/event/TransformationofConflictAnAnalysisofOpSadbhavanainJammuandKashmir_aanant. Retrieved 28 September 2013. ↑ "Operation Sadbhavna: 30 girls from J-K visit city". Feb 05 2013. http://www.indianexpress.com/news/operation-sadbhavna-30-girls-from-jk-visit-city/1069454/. Retrieved 28 September 2013. ↑ "Kashmir students on ‘sadbhavana' mission". December 15, 2010. http://www.thehindu.com/todays-paper/tp-national/tp-otherstates/kashmir-students-on-sadbhavana-mission/article953664.ece. Retrieved 28 September 2013. ↑ "With malice toward goodwill". September 28, 2013. http://www.thehindu.com/opinion/op-ed/with-malice-toward-goodwill/article5176540.ece. Retrieved 28 September 2013. ↑ Alastair Lawson. "Pakistan and the Kashmir militants". BBC News (5 July 1999). ↑ A.K. Chakraborty. "Kargil War brings into sharp focus India's commitment to peace". Government of India Press Information Bureau (July 2000). ↑ Michael Edward Brown. Offense, defence, and war. MIT Press (2004), p. 393. ↑ "Past peacekeeping operations". United Nations Peacekeeping. http://www.un.org/Depts/dpko/dpko/pastops.shtml. Retrieved 31 March 2011. ↑ John Pike. "Brass Tacks". Globalsecurity.org. http://www.globalsecurity.org/military/world/war/brass-tacks.htm. Retrieved 31 March 2011. ↑ John Cherian (8 June 2001). "An exercise in anticipation". Hinduonnet.com. http://www.hinduonnet.com/fline/fl1811/18110990.htm. Retrieved 31 March 2011. ↑ "Indian Army tests network centric warfare capability in Ashwamedha war games". India-defence.com. http://www.india-defence.com/reports/3115. Retrieved 1 June 2012. ↑ "Indo-US Army Exercise Yudh Abhyas". Defence.pk. 14 March 2012. http://www.defence.pk/forums/indian-defence/165331-indo-us-army-exercise-yudh-abhyas.html. Retrieved 1 June 2012. ↑ "Indian Army gears up for war game in Rajasthan desert". FacenFacts. 25 April 2012. http://www.facenfacts.com/NewsDetails/24655/indian-army-gears-up-for-war-game-in-rajasthan-desert.htm. Retrieved 1 June 2012. ↑ "Western Army Command conducts summer training exercises, IBN Live News". Ibnlive.in.com. http://ibnlive.in.com/generalnewsfeed/news/western-army-command-conducts-summer-training-exercises/997533.html. Retrieved 1 June 2012. ↑ "India, Mongolia engage in joint military exercises". 11 June 2013. http://www.business-standard.com/article/news-ani/india-mongolia-engage-in-joint-military-exercises-113061100792_1.html. Retrieved 27 June 2013. ↑ Exercise Nomadic Elephant, Indo Mongolian Joint Military Exercise. Facebook (2013-06-24). Retrieved on 2013-07-12. ↑ "Army and navy plan to set up a marine brigade". Indiatoday.intoday.in. 9 June 2010. http://indiatoday.intoday.in/site/Story/100770/India/army-and-navy-plan-to-set-up-a-marine-brigade.html. Retrieved 1 June 2012. ↑ "No Page Found". Khaleejtimes.com. http://www.khaleejtimes.com/DisplayArticleNew.asp?xfile=data/subcontinent/2007/December/subcontinent_December215.xml&section=subcontinent&col=. Retrieved 1 June 2012. ↑ Gautam Datt (13 October 2012). "Army to get attack helicopters: Defence Ministry". http://indiatoday.intoday.in/story/army-to-get-attack-helicopters-defence-ministry/1/224587.html. Retrieved 30 November 2012. ↑ "How Indian Army's Military Intelligence Directorate works : Special Report – India Today". Indiatoday.intoday.in. 28 January 2012. http://indiatoday.intoday.in/story/bangladesh-indian-army-military-intelligence-directorate-sheikh-hasina/1/170880.html. Retrieved 2012-11-04. ↑ John Pike. "Indian Army Divisions". Globalsecurity.org. http://www.globalsecurity.org/military/world/india/divisions.htm. Retrieved 31 March 2011. ↑ Indian Army Order of Battle. General Data LLC. 2010. ISBN 978-0982054178. http://www.amazon.com/books/dp/0982054173. ↑ "DRDO's F-INSAS programme to be ready in two years". 9 July 2013. http://www.defencenews.in/defence-news-internal.asp?get=new&id=1645. Retrieved 10 July 2013. ↑ "Night-vision devices for Indian Army approved". 2 April 2013. http://zeenews.india.com/news/nation/night-vision-devices-for-indian-army-approved_839359.html. Retrieved 10 July 2013. ↑ "Army to get night vision devices worth over Rs 2,800 crore for its tanks and infantry combat vehicles". 2 April 2013. http://articles.economictimes.indiatimes.com/2013-04-02/news/38218271_1_indian-army-indigenisation-ongoing-12th-defence-plan. Retrieved 10 July 2013. ↑ Pandit, Rajat. "Army to raise 2 mountain units to counter Pak, China". The Times of India, 7 February 2008. Retrieved 4 January 2010. ↑ "Prahaar Missile to be test-fired on Sunday". Ibnlive.in.com. 17 July 2011. http://ibnlive.in.com/news/prahaar-missile-to-be-testfired-on-sunday/167739-60-117.html. Retrieved 1 June 2012. ↑ "Indian Military News Headlines ::". Bharat-Rakshak.com. http://www.bharat-rakshak.com/NEWS/newsrf.php?newsid=19731. Retrieved 2012-11-04. ↑ Business Standard. "155-mm gun contract: DRDO enters the fray". Business-standard.com. http://www.business-standard.com/india/news/155-mm-gun-contract-drdo-entersfray/402834/. Retrieved 1 June 2012. ↑ Shenoy, Ramnath. "India to test fly light combat helicopters shortly". Press Trust of India, 14 December 2009. Retrieved 4 January 2010. Wikimedia Commons has media related to Army of India.